Ondine's new recording of works by Julian Anderson, released internationally in August 2006, has been chosen as 'Orchestral Choice' in the August issue of the BBC Music Magazine, as well as 'Editor's Choice' in the September issue of Gramophone (ODE 1012-2). 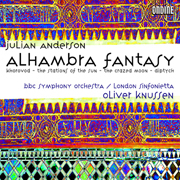 Julian Anderson's début recording contains his first acknowledged work, Diptych, which was composed when he was 23 and won him the 1992 RPS Award for Young Composers, as well as The Stations of the Sun, Julian's first BBC Proms commission, and a number of further career landmark orchestral works such as Alhambra Fantasy and Khorovod (London Sinfonietta commissions) and The Crazed Moon (BBC NOW commission). Oliver Knussen conducts performances shared between the London Sinfonietta and BBC Symphony Orchestra. In the UK, the release of the recording coincided with the extensively covered world première of Julian's new oratorio Heaven is Shy of Earth at the BBC Proms on August 6, featuring mezzo-soprano Angelika Kirchschlager and the BBC Symphony Orchestra and Chorus under the direction of Sir Andrew Davis. Both events were accompanied by major articles and interviews in The Times (July 28), The Wall Street Journal (August 4), and FT Magazine (August 5). The recording received outstanding reviews in The Sunday Times (July 30), The Times (August 4), The Guardian (August 4), The Daily Telegraph (August 5, Classical CD of the Week) and the Observer (August 6). Arnold Whittal's review in the Gramophone Magazine, accompanied by an interview with the composer, praises the recorded pieces as "formidably accomplished works" of "a leading talent". "With this release Ondine has made an impressive start to the Anderson discography (...). It is high time that Anderson was given due." In the BBC Music Magazine, Andrew Clements calls the recording "a wonderfully convincing survey of the early development of one of the most important British composers of his generation". "The big orchestral canvases show Anderson's priceless gift for making complex formal shapes totally lucid. Oliver Knusson's beautifully integrated performances with both the BBC Symphony and the Sinfonietta help inestimably, too." Born in 1967, Julian Anderson is currently Professor of Composition at Harvard University and Artistic Director of the Philharmonia Orchestra's 'Music of Today' series. in 2005, he became the fourth composer to be appointed Cleveland Orchestra's prestigious Daniel R. Lewis Young Composer Fellow, and the two-year residency will culminate in a major commission to be performed by the orchestra under Franz Welser-Möst in April 2007.